We refer to gum inflammation as gingivitis, which is a beginning form of periodontal disease. Periodontal disease includes inflammation and infection of the gums, tissues that support the teeth, periodontal ligaments, and tooth sockets. Long-term plaque deposits on your teeth cause gum disease. 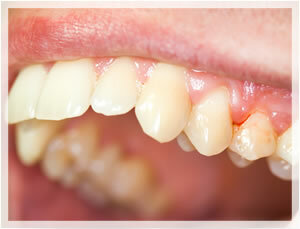 Plaque, if not removed, turns into tartar (or calculus), which irritates and inflames your gums. Bacteria cause the gums to become infected, swollen, and tender. Your dentist will examine your mouth, teeth, and gums to evaluate the appearance and health. If your gums are bright red in color, swollen, and tender to the touch, you may have gum disease, gingivitis, or periodontitis. It is simple to check for gum disease, and no further tests are usually necessary. If your dentist suspects the disease has spread to other areas of your mouth, dental x-rays may be recommended. Schedule an exam with your dentist every six months, so that we can keep an eye on the health of your gums. Our first step in treating gum disease is a professional tooth cleaning. If necessary, we may deep clean, or scale, your teeth. This removes the plaque and bacteria that cause inflammation and infection. Remember to always use preventative dental care to keep your mouth healthy. Call your dentist if you have red, swollen gums, especially if you have not had a routine cleaning and examination in the last 6 months.